As a born and bred Manchester girl, there’s one thing I am pretty good at, if I do say so myself. And that’s recommending all the shopping secrets of Manchester. It takes years of growing up in the city, exploring all the different areas, to be confident in recommending where’s hot to shop in this bustling city. There’s markets, department stores, shopping centers, retail parks, independent shopping streets… it’s a big big place, but I feel like after 29 years in Manchester, I know it like the back of my hand. One place that never lets me down, and a place I recommend to a lot of friends who come to the city for a weekend, is intu Trafford Centre. It’s an actual ‘day out’ destination in my opinion, filled with all your favourite brand names, from High Street to Designer. Inside, you have the whole entire spectrum under one roof- from the super affordable New Look and H&M, to the premium brands of Selfridges, and all those in-between stores that we sometimes can’t find in all shopping centers (like Lipsy and Glamorous for example – I only ever shopped these online before). When I was recently challenged by intu to showcase some of SS16’s hottest trends, which can be found across the center, I jumped to the opportunity. They are following so many lovely trends for the new season, including Boho Chic, Nautical, Monochrome, Imperial Red and Florals. I decided to give the Boho Chic trend a go, giving it a modern update this time, rather than the usual flowing skirts and embroidered tops I have styled up before. As you can see, I gave this trend a little twist by going for a lace up fitted top, layered up with a swinging waistcoat in faux suede, and a pair of high waisted denim skinnies. I purchased this entire outfit on a budget from Selfridges at intu, by raiding the Missguided and Primark sections believe it or not! It’s incredible that you can shop Missguided in ‘real life’ and not just online – another reason I enjoy shopping at intu. 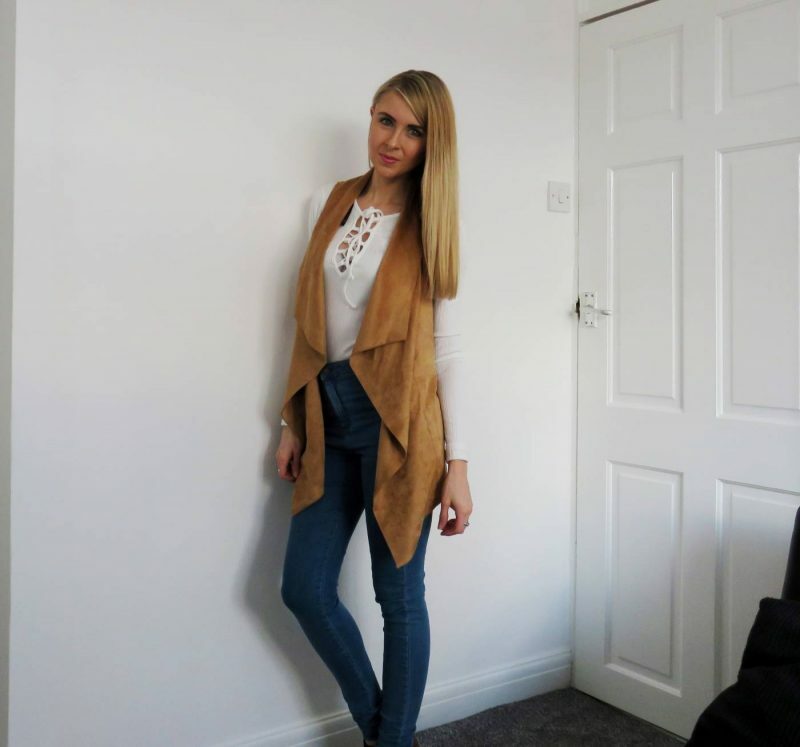 The white top is the Missguided purchase, and the very stylish boho inspired waistcoat is the Primark number. The skinny jeans are also from Primark, costing just £10, and then fit so snug with a comfy feel too. Love this look! From 8th – 10th April, there’s some gorgeous fashion shows going on at the centre too, situated over at the new Style Garden. If you head down between those dates, you can expect to see some regular shows from some of the top brands in the centre – such as Selfridges, John Lewis, Gap, Monsoon, Glamorous etc. They also have some fantastic new store openings this year too, starting with a brand new expanded Zara across two full floors, and Stradivarious and Pull & Bear to follow this Summer. So next time you want to do a bit of clothes shopping for the new SS16 season, why not take a trip to intu Trafford Centre? Next Post Beauty: Is Cacay Oil the next best thing? Love that waistcoat, such a cute shape and colour. I’ll have to take a look next time I pop into Primark! Thanks Ruth! From the top of my head I swear it was like £12 or something! Thank you – it does make a nice little layer up!